QUIZ: Think You Know The Elements & Principles of Floral Design? Has it been a while since you’ve reviewed the good ole’ elements & principles of floral design? Take this quiz and see if you might need to hit the books for a refresher! No matter how traditional or far-out contemporary, good design makes use of all these principles. Grab some scratch paper and get started..
1. What is not a primary characteristic of floral design? Preparing for the future is always easiest when we know from whence we came. In this month’s Aspects of Design from FlowerShopNetwork.com, we focus on popular periods of design and how they can be interpreted into floral designs. Below is a handy, easy-to-print chart with the style and time period in which the style of design was dominant. We also include a brief description of many styles. The Elements of Design are a universal concept shared between designers everywhere. Whether you are a floral designer, furniture designer, graphic designer, or even something as crazy as a cheese sculpture designer, to be good, we all use the same, basic building blocks. A good designer learns every aspect of his trade and uses the elements, along with the principles of design, to give their works an added little “oomph.” Anyone can put flowers in a vase, but only the most talented florists can tantalize your senses with their expertly crafted designs. 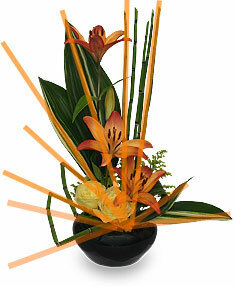 Using the right lines is important to convey your intended moods and emotions in your arrangements. Using line correctly, in conjunction with the other elements of design, can give your arrangement an overall finished, top-quality look. A visual path that directs eye movement through composition. Something arranged along a line, esp. a straight line; a row or series: a line of trees. A band of color, a seam, or a furrow: lines of stratification in rock. We all know what a line is, right? Sure, a line is a visual path between point A and point B, but that is just the start of it! Actual Lines are lines that are actually physically present. We may not think about it, but everything we use in our arrangements have line qualities in them. Leaves edges (curved, or straight) create line. Bands of color — such as a row of red roses amongst white ones creates line. Keep track of these little features in all your arrangements and you will train your eye to instantly see them. Implied Lines are lines that are created by your mind’s eye. Your choice of composition makes it appear as though they were there. A connection of two similar visual elements, the continuation of a repeated element in the arrangement — there are many many ways to use implied lines. A static line can be either vertical ( | ) or horizontal ( — ) and are at rest. These lines are not falling, leaning, or showing any potential for movement, so visually gives you the impression of rest. These static lines can give stability to an otherwise chaotic design. If you have a design you think is too dynamic, try adding a static line of some form to balance the look. A dynamic line as a line that is not horizontal or vertical. This can be curved, zigzagged, slanted, diagonal; basically anything that is not static. Dynamic lines infuse the idea of movement into your flower arrangement because these lines are not at rest. There are different degrees of dynamic lines in floral design as well. The softly curved edge of an Aspidistra leaf definitely gives you a different impression than a tangle of curly willow. Curved lines are those that gently relax into an arched shape. These are gentle, comforting lines. The human body is made up of curves, thus these lines are familiar, pleasing, and reflect relaxation and sensuality. Strong lines are those that are bold and in your face such as bamboo or Equisetum. These must be positioned carefully and very purposefully and give your arrangement a crisp, tight look. These are the types of lines that are rough, and jagged to create texture. These usually not used for the focal point in line designs. How do you use line in your floral designs? To florists and floral designers, “form” is the word used synonymously with “shape” and refers to either the outline or three-dimensional shape of a flower arrangement. There are two key forms in floral design terms. These are “closed forms” and “open forms.” Both are key elements of floral design and are essential to creating beautiful flower arrangements appropriate for any space or occasion. Closed form flower designs can best be described as “dense” because these forms lack negative space. That is to say, the floral materials used to create the designs are tightly packed allowing little to no room for light to pass through, thus it is one seemingly continuous piece and consistent shape throughout. An example of commonly used flowers with closed form designs are Beidermeyer style bouquets and centerpieces. These are very compact rings that together form a small dome shaped arrangement. Because there is little negative space (none) in a Beidermeyer style flower arrangement, these and other flower arrangements with similar styles are referred to as closed form flower designs. Open form flower designs are the opposite. These are considered light and airy. They have more negative space which may prevent the outline from being fully defined. Not defining the outline allows the design to merely imply a geometric shape. An example of commonly used flowers with open form flower designs are contemporary arrangements. While there are many closed form contemporary flower arrangements, most contemporary styles focus on the idea of the shape. Rather than present a shape, they present lines (linear flowers) that form unique angles, shapes, and appearances. Consider placing a light behind both designs and looking at their shadow on the wall. Like mass flowers, closed form flower designs will reveal an easily defined shape. Open form flower designs will produce a shadow that looks like no particular shape, but rather a series of overlapping lines and patterns. Most florists are naturally in tune with the shades and hues that make flowers complement each other properly. It’s something simply understood. We’ve already discussed the color use. In addition to this element of floral design, there are floral design principles surrounding what are often referred to as “warm colors” and “cool colors”. Warm colors are all of the shades of red, orange and yellow (red through yellow-green on the color wheel). These are called warm colors because of their association with sunlight. Most people associate with warm colors with sunshine, fire and energy. Warm colored flowers are often used to express a very energetic emotion such as passionate love, excitement and enthusiasm. When included in a mixed flower arrangement, warm colors often stand out and gather the most attention. Because they seem to “project” from the rest of the design, warm colors are often called advancing colors or aggressive colors. Cool colors are all shades of green, blue and violet (green through red-violet on the color wheel). Flowers in these colors are refered to as having “cool colors” because of their association with water, sky, grass and trees. These more earthy tones are used to express calm, relaxing emotions. Because these colors lack the energy of warm colors, they are also often associated with sadness and melancholy emotions. Because cool colors often sit back and let the warm colored flowers take the lead, they are often referred to as receding colors. It is important to note with both that flowers in both color groups unconsciously enhance certain emotions in individuals. For example, red roses automatically remind recipients of love and romantic occasions. 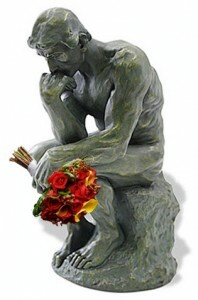 Therefore, red roses would be great for an anniversary but are less appropriate for funeral flowers. In the same way, cool colored flowers would be less appropriate for exciting occasions that merit indulgence and excessive emotion. There are exceptions (like new baby flowers for boys), but cool colored flowers should typically be used to enhance warm colored flowers, express a less enthusiastic emotion or encourage relaxation. Learn more about the color wheel used by florists. One of the best things about art class was being able to mix the paints and see all of the variations of color that formed from the controlled spills. Our eyes are naturally drawn to color and soak up the creative hues. Well, florists have the same opportunity every time an arrangement is started. Flowers come in a rainbow of colors so blending the shades and hues into a dazzling, eye-catching bouquet is truly an artform. Skilled floral designers are able to master this technique thanks to the color schemes found in the color wheel used by artists in a variety of genres. Most artists are familiar with the primary colors, secondary colors, and tertiary or intermediate colors. These colors form the basis of most other color schemes. The primary colors are red, yellow, and blue. These are the colors that can be blended or toned with achromatic hues to form every other color. Primary colors tend to be vivid and can therefore play a part in any arrangement needed a vibrant pop. These colors are often used alongside achromatic hues (white, black, gray) to please the eye. Secondary colors are orange, green, and violet. These are the colors formed from mixing one of the primary colors with another primary color. Tertiary colors are the colors between primary and secondary colors on the color wheel. Red-orange, red-violet, blue-violet, blue-green, yellow-green, and yellow-orange are the tertiary colors. These are formed from mixing a primary color with the closest secondary color on either side according to the color wheel. Tertiary colors are particularly appealing in fall flower arrangements and other occasions that require warm, muted bouquets. Understanding the basic colors and the basis of special colors is just the beginning in mastering the unique interweaving of colorful flowers into a dazzling arrangement. There are also various groupings of colors and their hues. Hue refers to the value of a color, i.e. the rich presence of a color as it applies to the gray scale. Basically, that’s a lengthy way to say how vivid or subtle a color is. Achromatic: Color scheme referring to a grouping of colors without hue. This includes white, black, and any shades (values) of gray. Polychromatic: Color grouping of multiple hues which may be related or unrelated. Complementary: A pair of hues directly opposite each other and equidistant on the color wheel. Complementary colors and schemes have many variations such as near-complementary, split-complementary, analogous complementary, and double-complementary. Analogous: Color scheme referring to the grouping of three adjacent hues on the color wheel wherein one color dominates. Ex: deep red, dusky red, dark orange. Diadic: two colors that are two colors apart on the color wheel; may also be seen as Dyadic referring to a grouping of two. Triadic: grouping of three hues that are equidistant from one another on the color wheel. Tetradic: a grouping of four hues that are equidistant from one another on the color wheel; forms an equally spaced double-complement. Using these color schemes, a florist can easily create dimension and a colorful dynamic in flower arrangements. Knowing which colors appeal the most to the eye when paired with other colors is as much a matter of science as talent. While no one doubts the designer’s eye of a florist, using the color schemes of the color wheel provides another form of inspiration for floral designers. Whether your creating or ordering a floral design it is important to understand the terminology. Since communication between designer and client is crucial, I thought that every so often we could discuss floral designs terms and procedures. Under the geometric design chart in the AIFD Guide to Floral Design is the term: Crescent Design. According to AIFD, crescent design is a three-sided composition having the form of a triangle with unequal sides. Asymmetrical triangle designs are generally considered to be less formal than symmetrical triangle designs. or in a more free flowing design. In fact, bear grass works well in creating movement when using a crescent design. So, why is it important to someone ordering a flower arrangement? Many times when someone places a flower order, an idea of what they want is dancing in their head. Often, the person placing the order has trouble relating the image in their head to the florist designing the flower arrangement. When both the customer and the florist understand a design and the term associated with it, then the image and the actual product will be more in sync. For florists, this design is something both the novice and experienced designer can create with relative ease and with a multitude of flowers, foliage, and other materials. I am interested in what you think about this type of design and in which ways you have used it. I would,also, like to know if their are other floral design terms that you would like to discuss. I thought it might be interesting to discuss floral design terms every so often. Today I thought we would discuss the term Tussie-Mussie or Tussy-Mussy. A Tussie Mussie is a style of bouquet often associated with the Victorian Era. This bouquet is composed of a small compact cluster of flowers or herbs. The stems are bound to create a round bouquet. When fashioned this way the bouquet can be hand held as a bridal bouquets or as an easy way to give flowers to someone who can then drop the bouquet in a vase they already have. The flowers and herbs used in a tusssie mussie are often very fragrant. In fact this bouquet is sometimes referred to as a nose gay.